Medical header bags are Ideal for bulky medical products like: gowns, draps, tubing sets, and large surgical kits that are packaged in medical thermoform trays. We provideTyvek medical header bags for medical packaging in two styles. We make a standard bottom load medical header bag where medical products are loaded through the bottom poly section of the Tyvek header bag. We also manufacture a ‘reverse load’ Tyvek medical header bag where the medical products are loaded into the header bag by the Tyvek strip. With the reverse load medical header bag, there is less chance of the Tyvek seal being damaged during the loading process. We offer medical header bags in all three grades of Tyvek. Poly bag thickness can be 3, 4 or 5 mil of LLDPE. 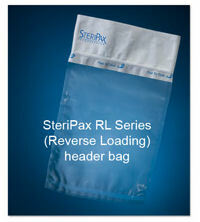 For more durability in a medical header bag we can use a 3 or 4 mil nylon/PE co-extruded films. For information on medical thermoform trays for packaging medical products click here.